If the United States, after withdrawing from the INF Treaty, places its missiles in Europe, Russia will find something to answer. In the event of aggression, our missiles will strike not only European countries that shelter American missiles, but also decision-making centers in the United States. This was stated by President Vladimir Putin on February 20 during the annual message to the Federal Assembly. The Supreme Commander noted that this will use the latest hypersonic rockets and other unique weapons. The expert explained to us what kind of armament is capable of such a retaliatory strike. The deployment of missiles aimed at Moscow in Europe is fraught with mirror and asymmetrical consequences, the president said. According to him, Russia will be forced to create and deploy weapons that can be used not only against “direct threat points”, but also against “decision centers” on the use of missiles that threaten Russia. If this presidential message is broadcast to a military language, then it is a blow to the territory of the United States, where command centers and government think tanks are located. Moreover, the president promised that the flying time of our missiles to “decision centers” would be commensurate with the flight time of American missiles to Russia – about 10-12 minutes. What means does Russia have at its disposal to reach the likely enemy in such a short time? Military expert Viktor Murakhovsky explained to us that this is most likely a ballistic missile with an effective range of five thousand kilometers, which Putin recently commissioned to create in two years. – Apparently, this is the reincarnation of the Pioneer rocket (RSD-10 Pioneer or SS-20 was banned by the INF Treaty in 1987, the stock of rockets was destroyed. – MK ) on a modern technological base. If you place it, for example, in the region of Chukotka, then it will block almost half of the territory of the United States, including the entire Pacific coast. In this case, as the expert believes, it is not necessary to deploy missile systems, for example, in Cuba or Nicaragua. We will reach the enemy without them. “Why expose friendly states to an unreasonable risk when we can safely place our missiles on our territory.” – says Murakhovsky. – Distances and power will be enough for us. In addition, Russia has an excellent “horse move” – ​​the organization of marine duty closer to the shores of the United States. The same hypersonic Zircon rocket, about which the president first said today, is perfect as a sobering countermeasure. It flies at a speed of almost 10 thousand kilometers per hour. 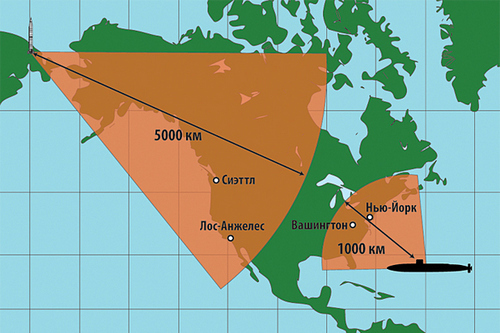 Zones of destruction of the territory of the USA by Russian new missiles. Get it everywhere. “This rocket hits the range up to a thousand kilometers, and together with the existing Onyx rocket, which is close in size, it will perfectly complement our fleet on duty in the Atlantic,” emphasizes Murakhovsky. “If such a duty is organized by submarines with“ Zircons ”at a distance of several hundred kilometers from the USA, then this will be an adequate response to the deployment of US missiles in Europe. As the expert noted, in the end it will deprive the States of winning the flight time of the missiles, which they are counting on by placing their missiles in Poland or Romania. No 10-15 minutes will give them the advantage – Russian ship-based missiles from the Atlantic will reach the US in 5-6 minutes. Military programs, which the president announced last March, are being implemented. Thus, successful tests of a nuclear-powered cruise missile were conducted. In the spring of this year, the nuclear submarine will carry the submarines of unlimited range “Poseidon”. Defense Minister Sergei Shoigu, in turn, confirmed that the Poseidon unmanned underwater vehicle had already completed sea testing grounds. And now he is on the verge of adopting. In the end, Putin turned no longer to the Federal Assembly, but to his American colleagues, who “had already tried to gain absolute military superiority with the help of a global missile defense system.” The president advised them to “first count” the range and speed of promising Russian weapons systems, and only then think about the decisions that threaten our country.